"[A] realm of intimate personal power is developing -- power of the individual to conduct his [or her] own education, find his [or her] own inspiration, shape his [or her] own environment, and share his [or her] adventure with whoever is interested. Tools that aid this process are sought and promoted..."
This page presents three portals to agroecology/sustainable agriculture practitioners and some of the technologies, , organizing strategies and policies a that have employed in Cuba, the U.S to advance the movement. The New Economics portal provides a context that bridges the two. Sharing these resources, tools and experiences is one of CUSAN's core functions. This page is an ongoing work in progress. The portals will be refined over time as part of our process to develop a user-friendly toolkit that can be tailored to individual needs. 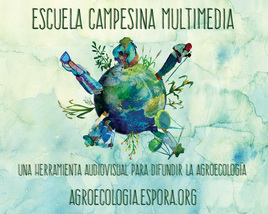 The National Small Farmers Association of Cuba officially released its "Multimedia Peasant School" designed to scale up agroecology consisting of books, documents, videos. Many of the tools referenced are not acknowledged or valued by our current economic system. A new economics is needed - one that works for people and the environment.. The U.S. members of CUSAN are a tremendous source of practical and field-tested information on sustainable agriculture and agroecology. Click below to learn more about them..